Images - Global images size options. API's - Global API's options. Optimization - Global Optimization options. Cookies Consent - Cookies Consent options. Processed image quality - Set quality of processed images. The higher the number the larger the image size. Default image sizes - Set default image sizes. These are only width values and images are not croped. Images can be accessed via following size handles; thz-img-xlarge, thz-img-large, thz-img-medium, thz-img-small, thz-img-xsmall. Custom Image sizes - Add custom image sizes. Compile inline CSS - Compile dynamic inline CSS to a file. Compile theme CSS files - Compile theme CSS files to a single file. Minify theme JS files - Minify theme JS files to a single file. Remove ver query strings - Remove ver query string from CSS/JS files. 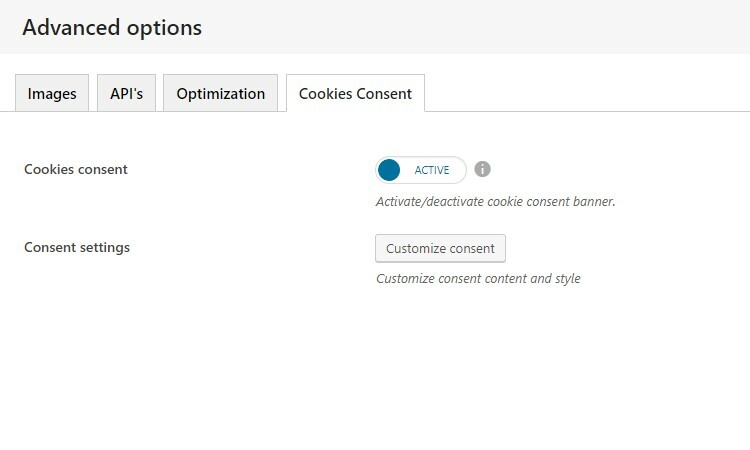 Consent settings Customize consent content and style. Consent box style - Adjust #thz_cookies_consent box style. Container box style - Adjust .thz-consent-container box style. Consent font - Consent font metrics. Link colors - Adjust link colors. Animate consent - Add animation to the consent container. Consent text - Add consent popup text. Create button - Customize the consent popup button. Customizer mode - Set default customizer theme options mode. If mode is popups, every theme options set you see in theme panel will be opened in a customizer popup and preview is visible once the popup is saved and closed. The popup setting will also speed up the first page load when entering the customizer. 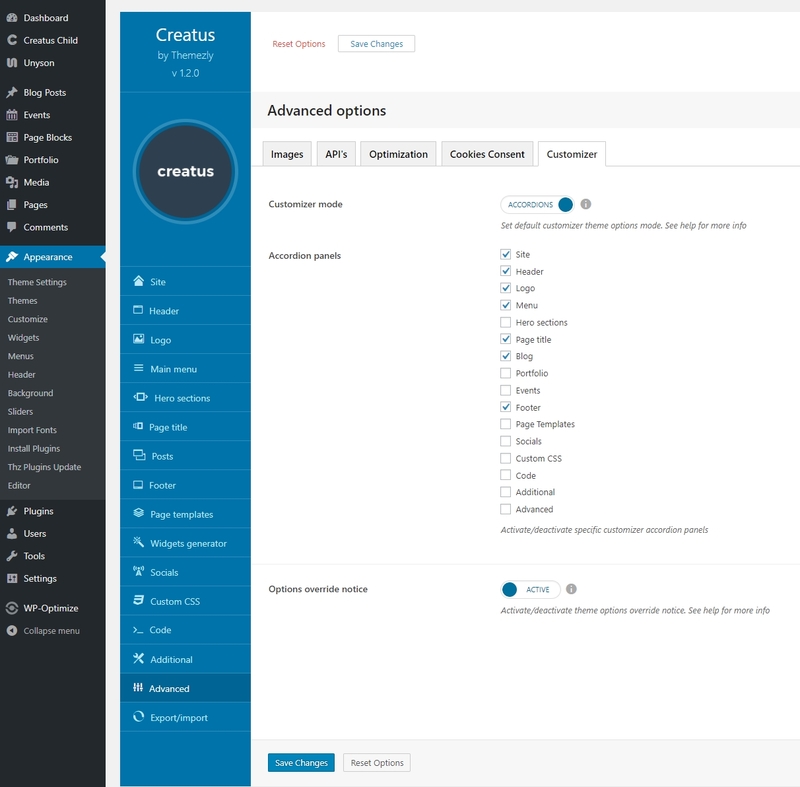 Customizer panels - Activate/deactivate specific customizer accordion/popup panels. Options override notice - Activate/deactivate theme options override notice. 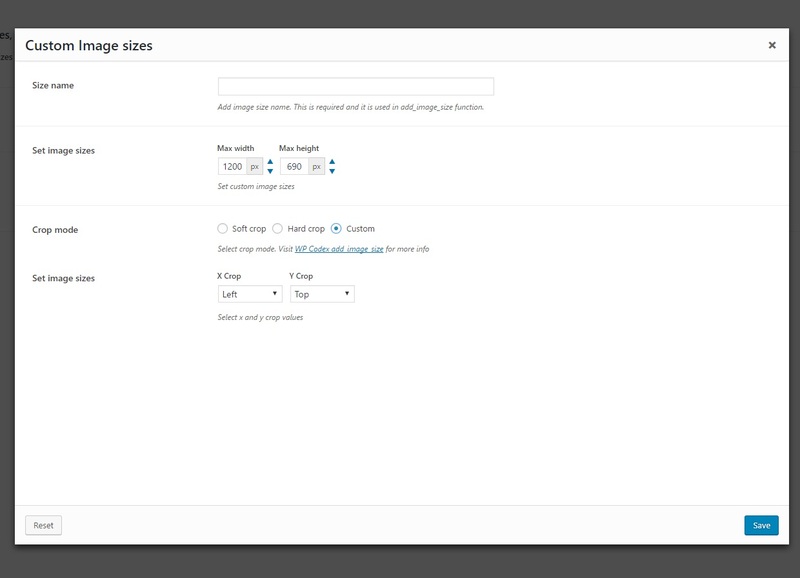 While working in customizer some pages might have theme options override. This option enables the notice advising you that some of the live preview options will not be affected by customizer option value change.